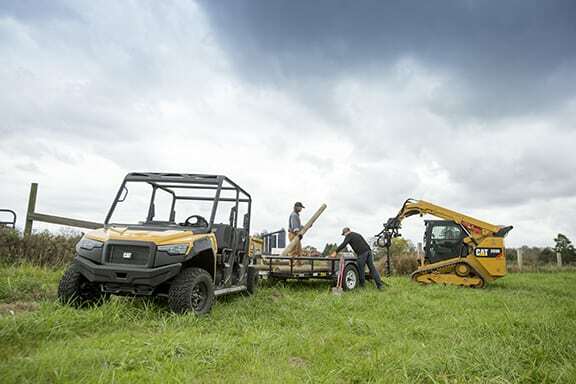 Last year, Caterpillar announced the introduction of it’s first-ever Cat utility vehicles — the gasoline-powered Cat CUV82 and diesel-powered CUV102 D. To expand that offering, the product line now includes two new additional units. Cat has revealed the gasoline-powered Cat CUV85 and diesel-powered CUV105 D. The CUV85 and CUV105 D both feature a spacious second row to accommodate a total of five people. Caterpillar gathered extensive customer and dealer input to build a UTV that delivers the unrivaled combination of durability, comfort and maintenance simplicity. Rigorous vehicle testing ensures both utility vehicles meet the superior quality and reliability customers expect from Caterpillar. The CUV85 and CUV105 D feature a rugged steel cargo bed and offer 1,000-lb (454-kg) total rear cargo capacity and 2,000-lb (907-kg) towing capacity for outstanding performance in a variety of applications. These Cat UTVs deliver a premium experience at a competitive price. The new CUV85 and CUV105 D utility vehicles boast a four-wheel independent suspension system with a front sway bar to provide unmatched stability at full load. A long swing-arm suspension, custom-tuned springs and shocks deliver a balance between a smooth ride and hauling loads. Ample ground clearance ensures these vehicles navigate rough terrain with ease. These Cat UTVs efficiently complete hauling tasks, quickly maneuvering over rugged terrain at the worksite at speeds reaching 45 mph (72 kmph), depending on model. The CUV85 is powered by a 0.8L three-cylinder gasoline engine delivering 50 hp (37 kW), while a 1.0L three-cylinder diesel engine delivers 25 hp (18.7 kW) power to the CUV105 D.
Features such as smooth acceleration, clear sightlines and engine braking capability make the Cat UTV well suited for hauling and towing. The intuitive column shifter allows the driver to easily maneuver through all the gears. Both models feature a continuously variable transmission, tuned specifically for work applications, offering smooth transitions and the ability to handle loads. The choice of two-wheel drive, four-wheel drive or four-wheel drive/lock modes permits the driver to match vehicle drive to ground conditions. Cat UTVs are built for quiet and comfortable operation all day long. The design minimizes noise and vibration during operation for a quieter ride. Spaciousness was an important variable when designing the UTVs. The CUV85 and CUV105 D comfortably seat five riders with copious leg, elbow and headroom for tall riders. Driver and passenger seats are both sewn for comfort as well as durability, plus the driver’s seat position and steering wheel adjust to ensure a comfortable fit. Ample behind-the-seat storage and document holder provide space for personal items and gear. Passenger seat bases can be removed and stowed behind the rear seat back to create floor space for hauling oversized items. Driving ease and comfort are hallmarks of the new Cat UTV experience. Electric power steering provides superior handling and tight turning capabilities. The instrument gauge offers easy viewing of critical operating information such as ground speed, engine speed, operating hours, odometer, battery voltage, and engine temperature and fuel level. Customers can customize their Cat UTVs to meet specific work needs through more than 50 accessory options. Multiple cab options with sealed surfaces on the ROPS structure provide a weather tight enclosure, while other offerings include backup alarms, heater, front winch and work lights. Cat UTVs are prewired for quick do-it-yourself installation of all options. Easy access service points simplify vehicle maintenance, while on-board advanced diagnostics reduce troubleshooting time. The new CUV85 and CUV105 D UTVs will be backed by unmatched service and support from participating Cat UTV dealers. Participating Cat dealers can help with anything from simple maintenance questions, to accessory selection, to on-site support. These UTV models will be available throughout the United States and Canada, excluding California and Quebec.